The SEOToolSet® is a suite of organic optimization tools built by SEOs, for SEOs. We created these SEO tools to help us do our jobs better and we hope, in turn, they can help you do your job better, too. The SEOToolSet is unique because it focuses entirely on search engine optimization. These tools are for advanced SEOs and marketers who want exportable, in-depth data and presentation-quality reports regarding on-page and off-page optimization. We say the SEOToolSet is “the deepest dive into SEO data available on the market.” These tools help solve the challenges SEOs face every day. I sat down with our SEO analysts to find out what I should say here to get you as excited about the usefulness of these tools as we are. To get you acquainted with how we’re using the SEOToolSet every day to serve our clients, we came up with three challenges to spotlight. There are so many more power tools in SEOToolSet 6, consider this merely a taste of what’s offered for the advanced SEO. Challenge 1: Prove SEO progress with reports that monitor objective rankings. Challenge 2: Figure out what’s “natural” among top-ranked competitors. Challenge 3: Efficiently find missing meta tags, duplicate titles, and problems with canonical elements. SEO is a long-range proposition. It can take a long time to see results, and clients or bosses (depending on who writes your paycheck) can grow impatient waiting for results. While webmaster tools and analytics can show you traffic increases and revenue growth, it’s helpful to have a way to monitor your site’s rise to prominence in the search engine results pages (SERPs) in an objective way. The Ranking Monitor is one of the SEOToolSet’s most powerful tools. Using authorized APIs, the monitor grabs unbiased, non-personalized rankings for lists of keywords — across Google, Yahoo and Bing and for dozens of markets around the world. Because we want to see for ourselves whether pages are moving up or down the SERPs, we built the monitor to run on a schedule, store historical ranking data to watch progress over time, and also keep track of competitor rankings to use for research or comparison. The data can be exported as CSV (to work in Excel). We also output print-quality Domain Ranking reports to send regularly to our SEO services clients, showing ranking changes either by market, page, keyword or competitor. 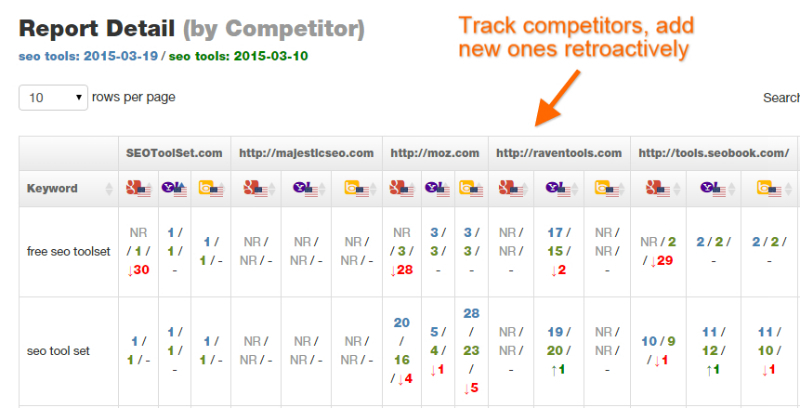 What’s new and cool about Ranking Monitor reports: Whenever some hotshot new competitor comes onto your radar, the Ranking Monitor in Version 6 lets you add the new competitor along with its past rankings for your keywords retroactively. So even though you just realized they’re a threat, you can include their history in your stored competitor data as if you’ve been watching them all along. On-page optimization requires understanding what the search engines find most relevant. It would be easy if there were hard and fast rules to follow, but every keyword query waves the starting flag for a SERP contest that’s unique unto itself. To know how to best optimize a web page, SEOs have to look at the sites that are ranking to see what Google is currently rewarding. This is not so easy, either. No one can stare at a web page and mathematically figure out its word count, frequently used words, keyword placement, content reading level and so on. Moreover, to find what’s natural among all the top-ranked sites, you’d have to do this analysis across many pages. We need SEO tools for this kind of thing from beginning to end. Pull up the unbiased top-ranking web pages for any keyword or phrase using the Research Summary tool. 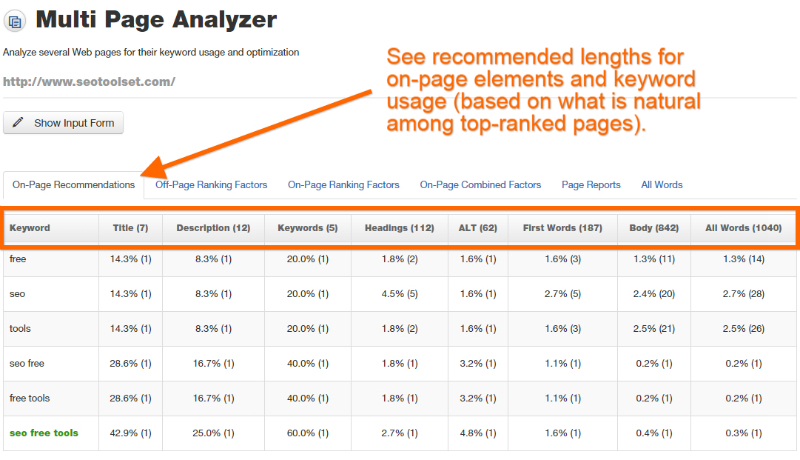 Choose the pages you want to analyze (the top five are checked by default, but you can select any you want). 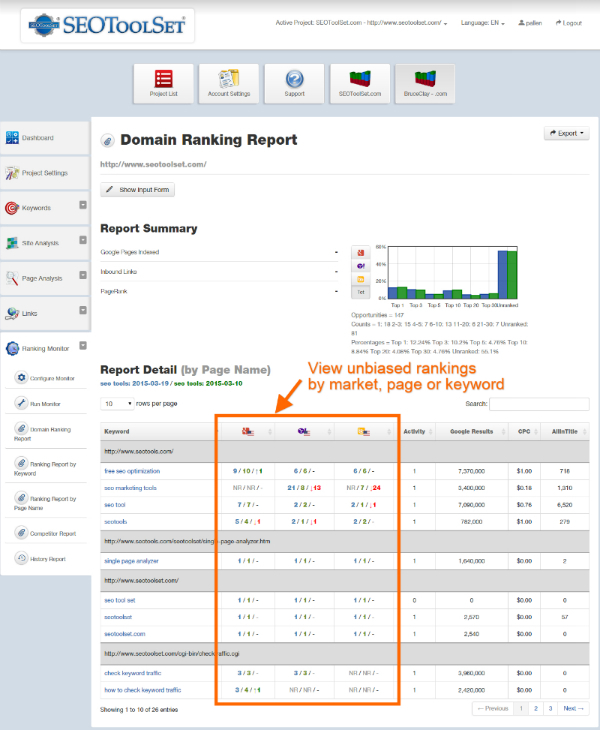 Run the Multi Page Analyzer tool to see data about each of the top-ranked sites as well as combined statistics. The statistical recommendations reveal where the sweet spot is for all kinds of on-page attributes, including the average length and keyword usage in the title, meta tags, heading, alt attributes and overall body section, as well as the average content reading level, among the top-ranked sites. What’s cool and new in the MPA: This SEO report was improved in Version 6 to handle more URLs — not just 5, but 10, 15 or as many as you want! The ability to analyze many competing pages at once can make the resulting information extra accurate. Our SEO analysts wanted a way to quickly look throughout a website to find missing or incorrect elements — pages with no title, meta description, or Heading 1, for example. The SEOs also asked for a way to search for any snippet of text to find where it appears in meta information sitewide, to avoid duplication. And for ecommerce sites and others, they needed a way to review canonical link elements and locate inconsistencies. The site spider crawls a website automatically, just as the search engines do. For SEOToolSet Pro subscribers, that gives you almost complete crawl data for your site — down to five clicks deep. The various reports produced by the site spider are custom-designed to give SEOs their dream data. 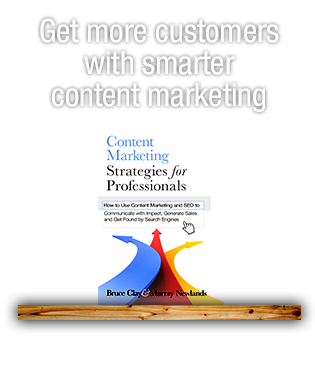 Sort by any column so you can easily identify missing or duplicated titles, meta descriptions, meta keywords, Heading 1 tags, URLs or canonical elements. Search for text in any of these important page elements sitewide. Export the data as CSV. What’s exciting and new: The rich data that the site spider collects fuels some other power tools, as well. One is the new Link Graph, which has all of our analysts buzzing. This tool lets you see the site’s linking strategy as an interactive, visual link map. Use this to confirm your site’s link architecture and siloing strategy at a glance. Ready to try some new SEO tools? I hope you’ve seen enough to know that these tools are created by SEOs, so they might work to solve some of your challenges, too. There are many more tools than the few I’ve sampled in this article. An SEOToolSet Pro subscription also includes tools and reports for link analysis, keyword research, competitor research and technical site errors, to name a few. 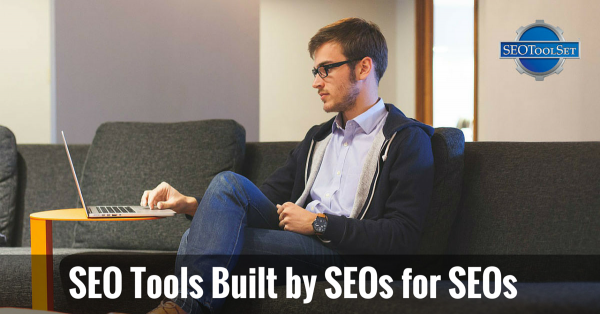 It’s easy and risk-free to sign up for SEOToolSet Pro. I encourage you to try these power tools out on your own site. If you decide you don’t need this much data, cancel within 30 days and we’ll refund your subscription fee entirely. After that, you pay as you go. 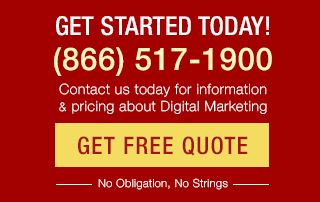 For $89/month you can run two website projects with an unlimited number of users. If you need to optimize more sites, additional projects cost just $30/month per website. And you can cancel your subscription to our SEO power tools anytime. Want more details? 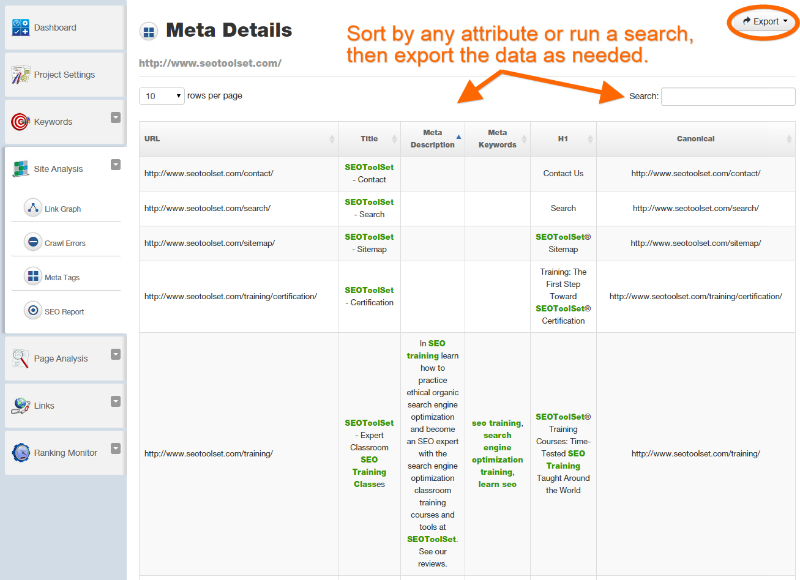 See our SEOToolSet Features page. Then try it out and let me know what you think. Emma: If you want a long-term, reduced price plan, the best way would be to attend our SEOToolSet Training course. Attendees get a free subscription for a year on up to 3 website projects for attending Standard Training, 5 projects for attending our Advanced class, and 9 projects if they also pass the free certification exam at the end of Advanced. Many people take the training annually to maintain their free subscription. (The material is constantly updated, so it’s never a repeat and keeps your SEO knowledge up to date, as well.) In addition to receiving top-notch SEO education and training on how to use the SEOToolSet software, training attendees get the best deal for the tools, without question. Hey Paula thank you so much for sharing this useful information with us. I would like to know more about that whether there is an lifetime plan for above tools and if yes what are the charges ??? Good information Paula. Thanks for the reply. I’m a big fan of your organization. Great relevant and timely info. interesting tips for modern seo , the best part of this article I read is checking or analysing 2 different websites and finding common things among them . Pravin: Agreed. :) The Ranking Monitor can be scheduled (set it and forget it), and you can choose from dozens of different search engine markets internationally. Thanks for telling us! Yes for bulk work and for clients site this is a must tool. Though I like the most of toolset 6 is “Ranking Monitor reports”. Hey RJ, sorry for the delayed reply; I was spending a few of my kids’ spring break days with them. Google doesn’t approve scraping of search results. A lot of SEO tools out there do this, and you’re right, it violates search engine guidelines. However, Google and the other engines provide APIs that customers can pay for that are authorized to gather rankings. Our Ranking Monitor is built on these authorized APIs. Don’t programs that automatically check rankings violate Google’s terms of service? It seems that has been the case since 2006 as published by Google. Wonderful, Andy. I hope you let us know what you think when you’ve gotten a few miles on the new tools. Our support team is ready to help in any way. 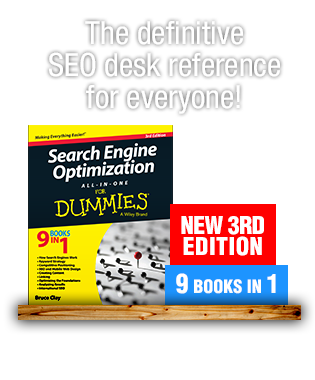 Awesome I am so excited to get involved with seo toolset 6! I don’t even know where to start you have me so amped! Thanks Bruce Clay and team for creating a powerful and affordable tool that allows us to do good work and bring SEO back!